On 10th June Philip and Melanie Gibbs and Richard Rowland replicated the visit in the 1920’s of Philip’s Great Grandfather Sir Philip Gibbs, and his wife Lady Agnes, Richard’s Great Aunt, to locate the so called “family schloss” of the Ditges family. Sir Philip was unable to find the “schloss”; perhaps if he had known in was the Bishop’s Palace he would have succeeded. Of course our Australian cousin, Jacky Fogerty had already located it online, so our task was easy. 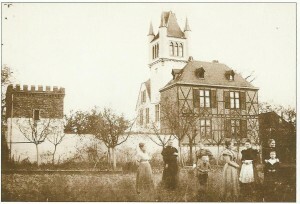 Friederich Ditges, who was the agent for Germany and Switzerland for Rowland’s Macassar Oil, acquired the Bischofshof in 1825 when it was secularised. Alexander William Rowland visited it in the 1830’s and met his daughter Henriette; they were married in 1839. It remained in the Ditges family until 1917 when it became a school; in 1942 the Gestapo moved in, and in 2000 it became the IUBH-a privately owned international business school specialising in tourism management. It has 1800 students of which about 80% are German. All students live on the extensive campus in modern accommodation. 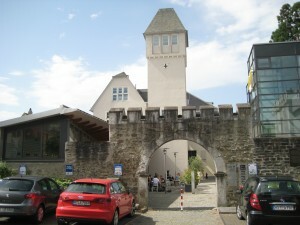 Of the Bischofshof, only the gateway and the main tower remain. 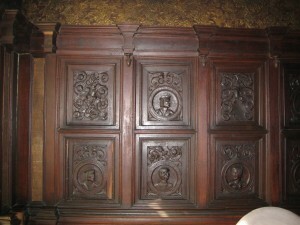 One of the rooms on the ground floor retains the original panelling. 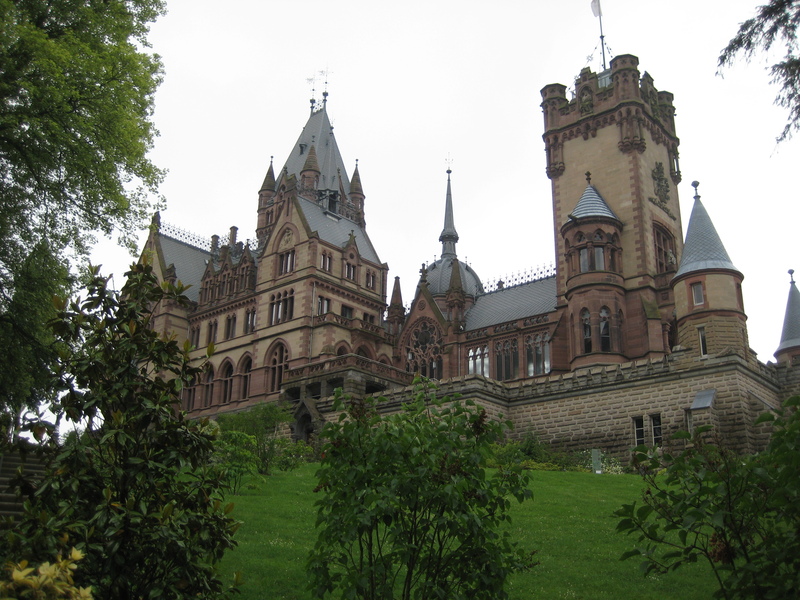 Bad Honnef is said to house more millionaires than anywhere else in Germany. It is certainly a delightful old town, with winding pedestrianised streets and pleasant gardens fronting the Rhine. We cruised down past Rolandsect, site of Charlemagne’s palace where his general Roland was based. The past the site of the Bridge at Remagen to Linz where Philip and Melanie toured the town whilst I sampled the delights of a beer garden. Visit by English descendants of the owners of the Bischofshof, Bad Honnef. 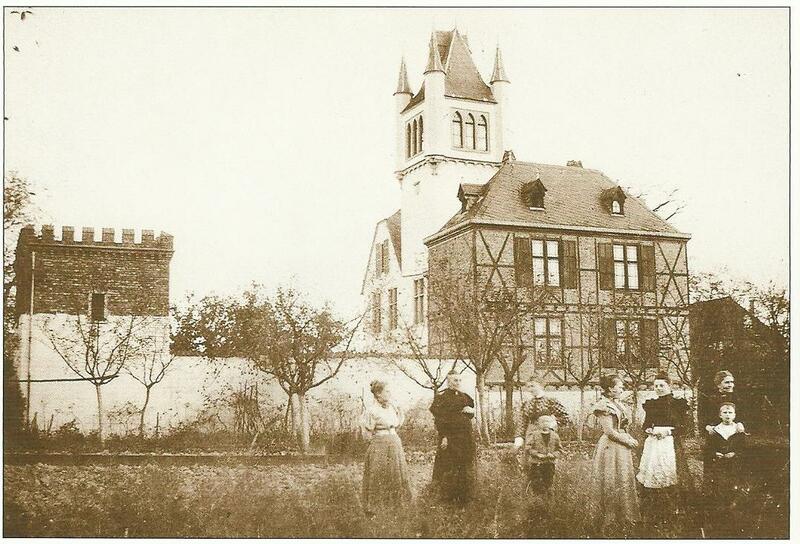 Richard Rowland and Philip and Melanie Gibbs are visiting the IUBH Business School, whose campus contains the Bischofshof, the family home of the Ditges family. In 1839, their relation, Alexander William Rowland married Henriette Ditges (see portrait) whose father Friedrich Ditges, a merchant from Cologne, had acquired the Bischofshof, after it was secularized in 1826. The last attempt by the English family to locate the Ditges family home was by Philip’s relations Sir Philip Gibbs, the war correspondent, journalist and novelist and his wife Lady Agnes in the 1920’s. They had a drawing of the Bischofshof, but failed to find it. It is possible that by then the building had been altered. (see photo) Thanks to the internet it is now easy to locate. Alexander William Rowland was the proprietor of Rowland’s Macassar Oil, a business founded by his grandfather in about 1800. It made and sold one of the first hair oils and was credited as being one of the first nationally advertised products. (see advertisement) Like the Hoover, its name became associated with the product. By the 1840’s the hair oil was being used by the Royal Family and nobility of England, as well as by several sovereigns and courts in Europe. The business was sold to Beechams, now part of Glaxo Smith Kline, in the 1940’s. Alexander and Henriette lived in London and had eight children. Henriette died in 1851 giving birth to a daughter, Henrietta who became a celebrated social reformer and founder of Hampstead Garden Suburb and the Dame Henrietta Barnett School for Girls in North London. So Henriette’s name lives on. Richard has recently published his family history, Fifteen Generations of the Rowland Family. It is available online at www.rowlandgenerations.org. This entry was posted in Book on 27 June, 2014 by Richard.